Being agile and ready for new technologies can be the difference between a business' success or failure. The term ‘innovation’ has become an overused buzz word over the past few years. In fact, it’s now so synonymous with business jargon that it is almost impossible to find a new product that isn’t branded ‘innovative’. But is the tech industry at risk of losing sight of true innovation, and further still, a way to introduce it? It’s an important question to consider at a time when CIOs are faced with the challenge of how to introduce new technologies that drive positive business outcomes. According to data from Ricoh’s Economy of People report, released earlier this year, technology is seen as the greatest driver of output-per-hour by both employees and employers. When asked about how technology impacts their working practices, everyone agreed that technology improves productivity, the ability to make better-informed decisions and the ease of working easily with others outside their business. I have observed that limitations to innovation usually lie not with ideas or technology, but with agility. In fact, lack of agility is often the reason that businesses fail – sometimes, with devastating consequences. It’s widely accepted that Nokia, for example, simply wasn’t set up culturally to react to the iPhone’s introduction and rapid adoption, despite releasing self-proclaimed ‘innovative’ products up until the sale of its mobile business to Microsoft in 2014. You only need to spend time speaking with a colleague or friend to hear various opinions on what a company ‘needs to do’ and what it ‘could do’. Aligning a company’s ’could do’ with its ‘needs to do’ is perhaps a CIO’s greatest challenge, and it is through promoting a truly agile culture that they can start to bridge the gap. Innovation doesn’t come about simply through continuous improvement – far from it. Rather, innovation is generated when the norm is shaken up, and the status quo vastly and rapidly improved. And it’s needed: global companies are regularly being disrupted by start-ups aggressively pursuing Unicorn status. Some companies attempt to transform themselves by turning to global consultants for an off-the-shelf technology upgrade, while others will acquire businesses in order to ascertain their knowledge and culture. 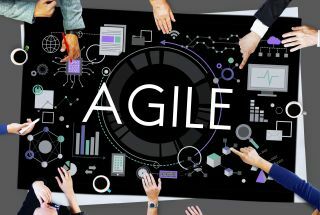 Adopting an agile approach and mindset provides a foundation that enables a business to react quickly and flexibly to a new trend or situation, and to keep innovating in the process. The challenge, of course, is making this shift to agile working happen. It’s not as simple as investing in new technologies and plugging them into existing working processes. Agility often requires a complete overhaul of a company’s culture, including its readiness to adopt and leverage new technologies effectively. The Economy of People report found that the UK could benefit from an additional £36.8bn in GDP if British businesses invested in optimising their workspaces, including elements such as their technology, culture and people. The importance of culture stood out within that process. Our research showed that 73% of people work more collaboratively with a better culture and that for 64% of people, it incentivises innovation through the organisation. Culture is also pivotal when assessing the impact of recent technologies. Take interactive whiteboards, for example. Their potential is difficult to dispute – digitally recording information for future access. But they need regular maintenance and updating, which requires a change of attitude from procurement teams. People need to be completely transitioned to them, rather than still having access to their old whiteboards (as is often reportedly the case). Demonstrating how an alternative approach can be realised, IBM recently installed 80+ interactive whiteboards with artificial intelligence (AI) in their global Watson IoT headquarters in Munich, Germany. IBM took the time to integrate its new whiteboards by leveraging what we call an innovation quadrant. This is where a company considers the physical space, the available technologies, the organisations willing to improve its processes and the mindset of its people before deciding whether to introduce any new technology. By taking these four areas into consideration, IBM fosters a culture of agility and innovation. As IBM knows, in order for investment in technology to become an innovative idea and for a business to be truly agile, phasing out the old before bringing in the new is crucial. Failure to switch old processes off completely will ultimately lead to new ideas not being embedded successfully into the culture of an organisation. As another example, the move to the cloud and the ease of online access to server storage has transformed the way organisations manage and share information. But we’ve all been in a position where we saved information to our local hard drive only to be quizzed by our colleagues about where it is on the file server. It doesn’t have to be that way. The Chromebook was designed around the cloud, so all the information is synced to the cloud and also accessible offline. Old processes can be perfectly adapted to new technologies. Agility and innovation are key priorities for any business – priorities which increasingly rest with the CIO and the IT team. But in order to support the business’ objectives surrounding innovation, it’s crucial that IT leaders develop a deep awareness and understanding of how company culture impacts the effectiveness of technology implementations. By understanding the organisation’s culture first, and how to optimise it, they can assess its readiness to change – in other words, its agility. This can therefore help to predict the likely success of new technologies before they are purchased, instead of simply evaluating them on the basis of their ability to provide new ways of doing things. So maybe, when presented with the latest must-have technology solution, you should ask yourself not “why do I need it?” but “are we ready for it?” In doing so, you might need to rise to the challenge of developing organisation’s agility and readiness for new technologies. Solve that problem and you are truly ready to innovate.